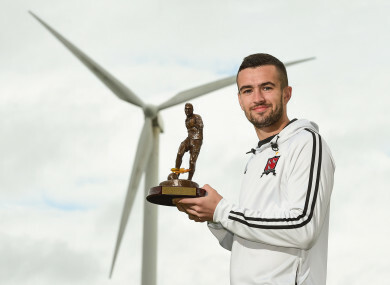 DUNDALK WINGER MICHAEL Duffy has been named SSE Airtricity League/Soccer Writers’ Association of Ireland Player of the Month for August. The 24-year-old has been in incredible form this season — scoring 12 goals in 30 appearances. Last month, he bagged three in the league, including a winner against Limerick, which saw Stephen Kenny’s side open up a six-point advantage over rivals Cork City. This is the former Derry City star’s second time winning the award, having also picked it up back in April. “I’m delighted to win it again,” said Duffy. “I’m enjoying how the season is going at the minute as I’ve been playing well. I just want to finish the year off on a high. Dundalk have no game this week, so all their focus will be on the top-of-the-table clash at Turner’s Cross in eight days’ time. “We will have had a full two weeks training before Cork, so we’ll be well prepared for that, whereas they have a game against Bohemians first,” Duffy added. Having been contacted by Martin O’Neill, the ex-Northern Ireland U21 international has recently declared his intention to represent the Republic of Ireland. And with Uefa Nations League fixtures against Denmark and Wales coming up next month, Duffy is hopeful his club form will be enough to earn him an international call-up. Since I got the call from Martin O’Neill, I’ve been doing well so hopefully next time around the papers will have gone through and he picks me in the squad,” Duffy says. In winning the prize, Duffy saw off second-placed Sligo Rovers forward Raffaele Cretaro and his Dundalk team-mate Chris Shields, who was third. Email “Player of the Month Duffy eager to earn first call-up after declaring for Republic of Ireland ”. Feedback on “Player of the Month Duffy eager to earn first call-up after declaring for Republic of Ireland ”.